A project called Connected – for Holocaust Survivors’ Welfare is being operated by Ortov in Israel Sci Tech Network schools, aiming to promote access to computer usage and exposure to the World Wide Web among survivors, as well as maintaining ongoing relationships of pupils and communities with Holocaust survivors. In 2016, the Israel Sci Tech Network was awarded the Light Award for the contribution made by the Connected Project, and for the network’s commitment to the welfare of Holocaust survivors. Students participating in the Connected Project took an active part in an intergenerational symposium titled “Holocaust Survivors Shaping Memory and Building a Nation”, relating to Israel’s 70th anniversary. Holocaust Survivors involved with the Connected Project were invited to the schools’ Holocaust Memorial Day Ceremonies. Holocaust Survivors took part in the school’s ceremony, and received a certificate of merit. The Municipal Culture Hall showcased an exhibition dedicated to the intergenerational conversation taking place within the school, involving Holocaust survivors, in the framework of the Connected Project. Some of these survivors took part in the school’s ceremony. During the ceremony, names of their perished relatives were recited, and representatives were invited to light a memorial candle. In addition, the ceremony included a showing of a play co-produced by survivors and pupils. Holocaust survivors were invited to the school’s ceremony, as well as group discussions of students with Holocaust survivors during the day. Students participating in the Connected Project went for a tour in the Connecting Path between Yad Vashem Museum and Har Herzl Cemetery. The school showcased an exhibition combining survivors’ photos and stories. 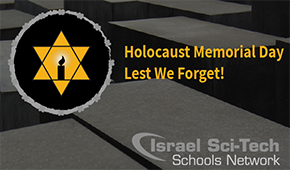 Holocaust survivors were invited to take part in the school’s ceremony, and some of them participated in classroom activities. Students participating in the Connected Project told their classes about their meetings with Holocaust survivors, and related the benefits they’ve gained from meeting them.